Who doesn't love a Blue and White Scrap Quilt? Folk lore may be correct in asserting that Irish immigrants brought this design to the America colonies; the design becoming popular with pioneer quilters across the country. An 'Irish chain' was a surveyors instrument, slightly larger than 10 inches. Another theory is that the pattern is an adaption of an old weaving structure. Historian Barbara Brackman states that the earliest recording of a quilt in this design is 1814. Whatever its History, this block structure is easy for beginners as well as providing excellent blank spaces for decorative quilting. Page 25 of February 2013 Template has the instructions for this easily rotary cut block, utilising off white with varying blue fabrics. 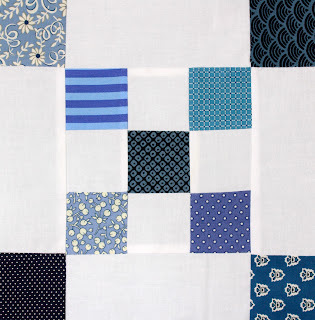 So, raid your stash please (who wouldn't love a new but traditional Blue and White quilt for their home), construct a block or two, and bring them to the Burwood meeting on Saturday 18 May, or post them to reach the Guild Office by 14 May. Remember, "Winner takes all" and the drawing of the prize always provides much delight at Guild Meetings. The guild has engaged the very experienced quilter, Robyn Johnston, as next presenter for Friday Showcase. A 1972 USA patchwork publication about Seminole Piecing was the initial inspiration for what has become a 40 year devotion to the craft, with a constant application to learning new methods, as well as a subsequent sharing of knowledge as a teacher. Robyn will no doubt have many stories to tell about her international quilt journey, her involvement with Hunters Hill Quilters, all whilst illustrated by the wonderful quilts that depict that journey. "Exploration in Isometric Universe" 2012 Member's Choice Award, Hunters Hill Quilt Show. On Friday 5th April members of the Quilters' Guild of NSW Inc were treated to the colourful inspiration and creativity of fellow quilter, Catherine Butterworth. All of her quilts display a faultless attention to construction and design detail, and it was wonderful to be able to view them so closely. Catherine admits to having a twin personality when it comes to quilt making.... her birth place of the USA results in many quilts displaying a 'Traditional' appearance, whilst Australian influences cause other quilts to be extremely colourful, as her Wedding Ring quilt, below, shows. Thankyou Catherine for sharing your stories and beautiful quilts with other members. This is the glorious flyer for the upcoming 13th biennial Quilt Exhibition, being organised by Eastwood Patchwork Quilters. It is an illustrative section from one of the 2 colourful Canyon Star block raffle quilts that members have been creating. The stunning first prize quilt has an added magnificent applique bird in the centre. In 2011 their event was such a success that $8000 was raised as a donation to Achieve Australia. This year these talented quilters are supporting Special Olympics Australia with raffle, donations and entrance monies. Previous attendees at this very popular quilt show will know that the exhibition venue will again be the historic Brush Farm House at Eastwood. This year's quilt show will be held just one week shy of the 200th anniversary of Blaxland, Wentworth and Lawson setting off on the expedition that forged the first European crossing of the seemingly impenetrable Blue Mountains. There is Disabled Access and wheelchair available. Entry Free : however donations are welcome. If driving in the Blue Mountains recently, you may have seen some of the many colourful banners advertising an upcoming Quilt Show. Quilters from the Springwood Community are staging an autumn exhibition in late April and invite all to attend. 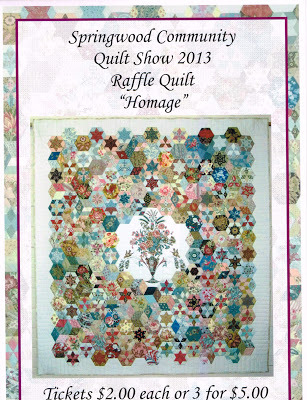 Pictured, is the raffle quilt showing the current popular design trend of using an infinite variety of fussy cut hexagons, all exquisitely pieced, surrounding a stunning centre panel. There will be a "Featured Quilter" this year, and it is Nerida Richmond-Benson who will be displaying her Japanese-themed quilts on the stage of the venue. Along with the many member's quilts to enjoy, there will be 10 quilt related traders, and a great cafe to patronise. Enjoy a weekend drive amongst autumnal colour and visit these dedicated, creative quilters! If you are heading towards Pt Macquarie this weekend then you are invited to attend the Biennial Quilt Show that Wauchope Patchwork Quilters' Inc are proudly putting on. Wauchope is a thriving rural town at the heart of the Hastings River Valley. There is a great community spirit in this area, apparent at gatherings such as Farmers Markets and Quilt Shows! All are invited to enjoy this colourful event, and meet members from one of our guild's Country Groups.